One of the biggest issues with numbers in another language is just knowing what a number is without having to count up to it. This simple card game from Spanish Mama called "Mano Nerviosa" will solve that problem! And the beauty of this game? Everyone is engaged and paying attention! I always have dice within dice on hand. They can be used in a variety of ways in a foreign language classroom. (See this post.) When it comes to math you can do simple problems. Have your students roll one of the die (which is really two of them) and then say a math problem out loud with the numbers on the dice. They can use addition, subtraction, or multiplication. Sequence is a great game for all ages and there are several different versions out there (from different versions for kids all the way to the grown-up version of the game). Sequence Num6ers uses addition and subtraction problems. As students take turns, they say the equation out loud in the target language and then can place their chips on the board. Lately, I have been playing Multiplication War with some of my students. In order to incorporate Spanish, I have my students say the answer out loud before they decide whose number is bigger. There is also Addition and Subtraction War. This simple game called I Sea 10! 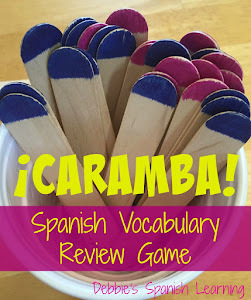 can be played in the target language. The object of the game is to collect chips that equal up to ten. 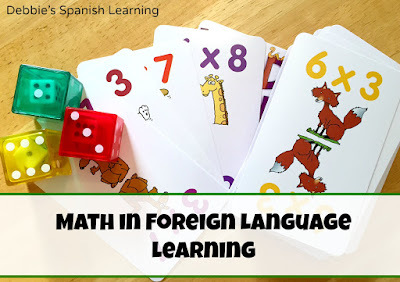 As chips are turned over, have your students call out the numbers in the target language. When they see two chips that equal ten they can also say so in the target language (i.e. in Spanish..."Veo diez"). If you have a group of kids or students you can get them into a big circle and have them pass/toss a beach ball to each other. 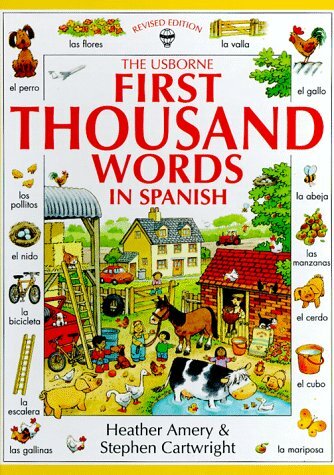 The first person to have the ball starts counting in the target language (For example, they say "uno".) Then the next person to receive the ball says the next number (dos). Continue until they have counted up to a predetermined number. This can also be done with skip counting. I have also used this book and a bag of candy to review numbers and colors. The exercises in this book have students do grouping (the beginning of multiplication) and shapes. And finally, when my students have a basic grasp of numbers 1-100 I use mystery pictures with them. Here is my post explaining how I do it.